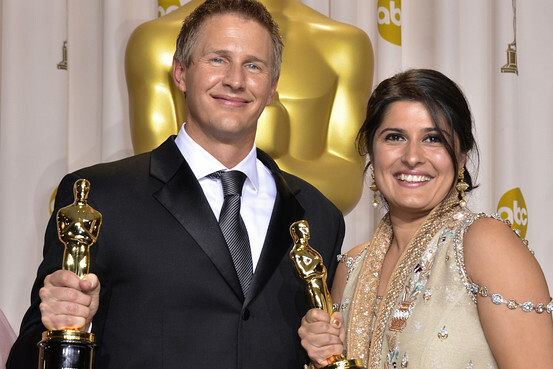 Filmmakers Daniel Junge and Sharmeen Obaid-Chinoy posed with their Oscars at the 84th Annual Academy Awards in Hollywood, California, Feb. 26. In forgotten rural parts of Pakistan, more than 150 women are disfigured annually by acid attacks, often by jealous husbands or families obsessed with honor. The attacks are meant to mark the women for life as having failed to live up to a rigid code of honor that has more in common with Medieval values than the 21st Century. After years of anonymous toiling, those who work in Pakistan to end this brutal practice have notched up some successes in recent months, including heavier sentences for acid attack perpetrators. And on Sunday night, when Pakistani filmmaker Sharmeen Obaid-Chinoy accepted her Oscar for “Saving Face,” a documentary about a doctor’s efforts to reconstruct the faces of acid attack victims, the campaign got an unexpected shot in the arm. “It’s highly symbolic. It’s a message of hope,” Valerie Khan Yusufzai, chairwoman of Pakistan-based Acid Survivors Foundation, whose work with victims features in the film, said of Ms. Obaid-Chinoy’s Oscar win. Films don’t often change the world by themselves. But in this case, Saving Face appears to have caught a zeitgeist in which Pakistani women are starting to get traction in a fight for equal rights. The film, which was co-directed by U.S. documentary filmmaker, Daniel Junge, could also work to tackle a stereotype, held widely outside the country, that Pakistan is a quasi failed state. Yes, the country faces enormous problems, not least the prevalence of acid throwing, which speaks to how tribal justice fills a legal vacuum in some rural parts of the country where women are less educated and have fewer opportunities. Only a fraction of acid attacks are successfully prosecuted. It’s even unclear whether the film will be widely viewed in Pakistan, where documentaries, by Ms. Obaid-Chinoy’s own admission, are not popular. But the film, which also charts one victim’s successful quest to get her husband convicted, shows how women, including victims, are fighting back and starting to achieve some results for their efforts, says Sherry Rehman, Pakistan’s ambassador to the U.S.
“Women are doing cutting edge things in this country, and for every few cases of oppression, which all South Asian countries remain challenged by, in Pakistan there is a woman who stands up and makes her community and her country proud,” she said in an email. Acid Survivors Foundation says there are at least 200 recorded attacks each year, three-quarters of them on women or girls, but many more victims are scared to speak up. In December, after intense pressure from civil rights groups, Pakistan’s Senate passed legislation that mandates a minimum 14 year jail sentence and a 1 million Pakistani rupee fine ($ 11,000) for convicted acid throwers. That’s double the average time in prison that courts have handed down to perpetrators of such attacks in the past. Of course, legislation is only part of the story. But rights activists say police are facing more pressure to register and investigate complaints from women who have been attacked with acid. Ms. Yousufzai says so far this year police have begun investigations into six acid attacks, which represents 100% of cases that have been reported. In the past, police typically have launched probes into only a fifth of cases put before them, Ms. Yousufzai adds. This is a big advance for campaigners, who long have criticized the police for pushing cases back into villages to be settled between families, a situation that helps perpetuate the violence. Now, campaigners are hoping Ms. Obaid-Chinoy’s newfound celebrity will keep up the pressure. The next battle? This year, activists are pressing for Pakistan’s provincial governments to pass draft legislation to guarantee financial compensation and other support mechanisms for victims of acid attacks.